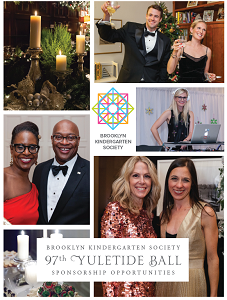 Brooklyn Kindergarten Society’s annual Yuletide Ball raises significant funds for life-changing programs, is the cornerstone of the Brooklyn holiday calendar, and is attended by more than 900 residents of Brownstone Brooklyn. Individuals have an opportunity to underwrite specific programs at BKS through the Families Helping Families Fund in honor of Yuletide. Questions? Contact Ashley Brown at abrown@bksny.org.